My experience regarding the evaluation and management of my neck (cervical) condition, under the care of my colleague Dr. Jeffrey R. Carlson, M.D. has been outstanding. He was highly recommended to me and I am very happy that I chose him as my cervical spine orthopedic surgeon. His practice includes a state of the art facility and is very efficient and convenient. He employs an excellent support staff and has many convenient on-site ancillary services. The staff at Mary Immaculate Hospital where he performed during my surgery was outstanding and very detail-oriented. Throughout my encounters with Dr. Carlson, all my questions here answered and he is always accessible, particularly with the convenient electronic communication technology that his practice employs. His medical and surgical expertise and skills are exceptional. He is very personable and is an excellent doctor. I am very pleased that my posterior cervical decompression and fusion surgery of 4 levels, a very major big-deal for me, went seamlessly well. At 6 weeks post-op, I can say my surgery was a good decision for me, it is a success and I am progressing remarkably well. 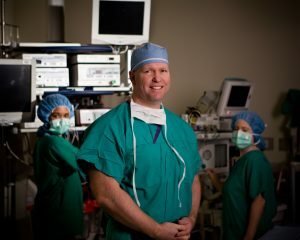 I very highly recommend Dr. Carlson, without reservation, for his specialty care in orthopedic spine surgery. I thank and praise God for Dr. Carlson and I pray for his continued success and blessing. Thank you, Dr. Carlson.